I say this because I know not everyone uses TS/Vent so would be a way to re-group and chat if server goes down. And if we use TS even without mic it has a chat feature so who doesnt like to talk can write. What you say, we can use other kind of chat, whatsapp group or whatever you want. Re: Server Down? Chat up! 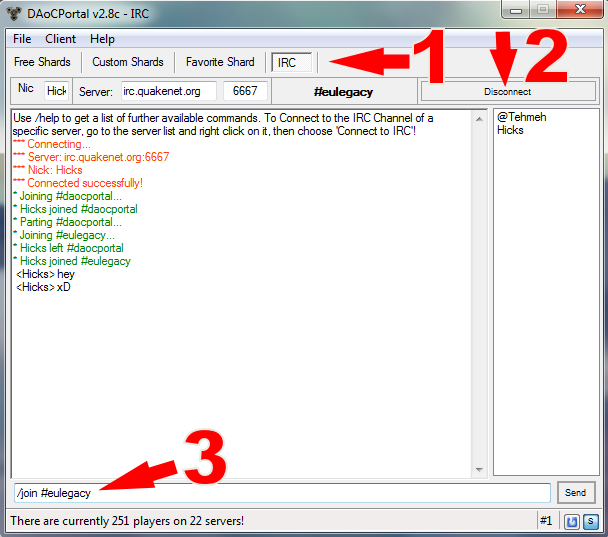 I used IRC a couple of times allready ( with bots , beeing op in some channels). But only for other cases like drawing and such. If someone would set up a channel..and people would want it..sure. No necessary to register a channel, will be used just in this occasions. went by vent, was empty apart from tehmeh, so now I'm eating candy and keeping an eye on genesis site. Never tryed irc (just, it's the truth....) but sure. Anyway. Anyone got a suggestion for some music while I wait?